Most of the friends I made in graduate school would probably be placed on the liberal wing of the American political spectrum. They’re awesome people and I like them a lot. But I often struck by how intolerant and hate-filled many liberals are. Certainly, more so than conservatives that I meet, or see on the news. For instance, take this thug, Mona Eltahwy. After seeing speech she disliked, Mona’s response was to vandalize it. When someone attempted to place her own body between Mona’s spray-paint and the speech Mona despised, Mona sprayed her too. And now on CNN, there is a puff piece support Mona, talking about how she “brought attention” to an important issue, blah blah blah. So why are so many liberals hate-filled and intolerant, when explicit rejection of hate and intolerance is generally seen as a “liberal” virtue? My assumption is that people generally self-select friends, co-workers, and opinion leaders who they are already politically agree with. So political intellectual diversity is rare in almost everyone’s life. But the high-visibility media clearly shares more of the world-view, perspective, and priorities of “liberals” than “conservatives.” This means that it’s rare for liberals to hear any serious voice with a fundamentally different perspective (outside the existing liberal political coalition). It’s very common for conservatives to do so. Therefore, when a thug like Mona Eltahwy encounters speech she disagrees with, of course she reacts violently. And her friends in the media likewise are very sympathetic: who wouldn’t censor speech they dislike? “War Plan Red” was the color-coded war plan for a United States war against the British Empire. One objective of Red was securing Crimson, the occupation of Canada. War Plan Red was unexpectedly referenced today, when the U.S. Department of State denied that the U.S. was planning to invade Canada. The State Department is denying that a planned closed-door meeting between U.S. Secretary of State Hillary Clinton and Mexico Foreign Minister Patricia Espinosa is about a secret plan to invade Canada. “No, no, no,” State Department spokeswoman Victoria Nuland said during a Tuesday briefing to laughter from reporters. Ultimately I think I disagree with President Bush’s ban on federally funded stem cell research using new stem lines. Obama has since overturned the ban, so the issue is now mute. But I was am still disgusted by those who took the issue lightly. President Bush correctly saw very frightening possibilities, and erred on the side of the precautionary principle. We can now steer animals with joysticks. 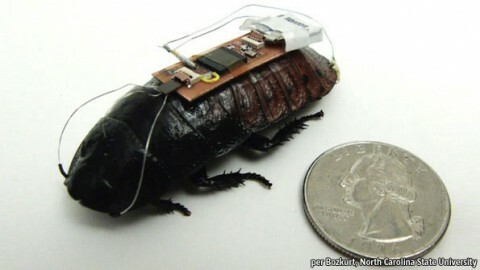 How long before we can steer mammals with this? Humans? Whatever creatures will be next? This post has three parts. In the first, “The Lord,” I discuss the human impulse to worship. In the second, “The State,” I discuss the role of government. In the third, “The Election,” I discuss these things in the context of the 2012 Presidential Election, and some recent remarks by Governor Mitt Romney. The word for “lord” derives from the phrase “loaf-ward” (in Old English: hlaf-weard). When the power to Give Law and the power to Feed are united in one man, the natural human response is worship. This impulse is so strong you can make a religion of it. There are 47 percent of the people who will vote for the president no matter what. All right, there are 47 percent who are with him, who are dependent upon government, who believe that they are victims, who believe the government has a responsibility to care for them, who believe that they are entitled to health care, to food, to housing, to you-name-it. That that’s an entitlement. And the government should give it to them. And they will vote for this president no matter whatâ€¦These are people who pay no income tax. It’s obvious to anyone with a brain that Mitt Romney was not the outcome of a specific election. Romney’s been in politics too long for anyone to seriously believe that he is ignorant of how politics works. Of course the Hebrews in the Desert built their Golden Calf. Judas at the Last Supper sold Christ to the Priests. But these are the exception that prove the rule: not scraping before The Law and The Wealth is seen as weird, deviant, temporarily, and ghastly. Now, this is not the darkest moment of the Republican. 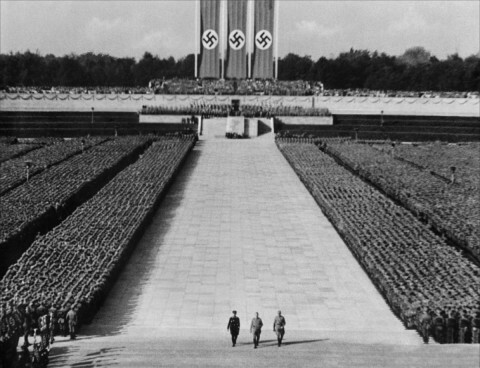 Obama is not some Mussolini-style monster: he won’t create a durable cult of personality or a network of concentration camps. We already had a monster like that in Franklin Roosevelt. And like Russia, and like China, and like Japan, and like Italy, and like the rest, we learned our lessons. We have Presidential term limits for a reason. No matter who wins, in the next four years weâ€™ll be killing a lot of Muslims who are already irate at us and have it coming, turning the ship on our catastrophically awful public educational system, making sure people who are friends with high-level execs at Goldman Sachs donâ€™t lose money, and making sure that we have the Mexican and Asian workers we need while making people who donâ€™t want to compete feel good about themselves. But there is a question: do have bias the discussion in favor of expanding the worshipers of the State — those who see the federal government as the Wealth & Law Giver – or do we bias it against that view? Do we want a government we worship, or one we fear? Because if an individual give Law but not Wealth, the reaction is fear. You limit such a creature, distrust it, and chain it with cumbersome rules. If the federal government is already your Lord, if it already combined the source of Law and Wealth for you, it’s probably bizarre to think of fearing it. Doing so would be just inhuman. But if you’re not already dependent on it, if you want to keep your freedom, it probably seems ghastly to think of worshiping it. That is part of what this election is about. Several weeks ago I read Ghost in the Wires, Kevin Mitnick’s autobiographical accounts of his hacking exploits, discovery by security researcher Tsutomu Shimomura, and reformation. 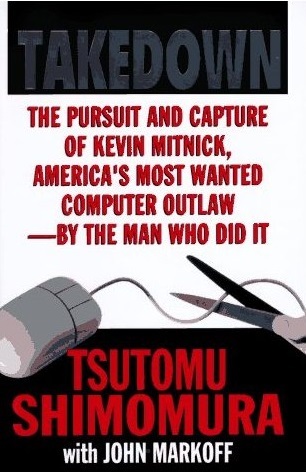 Yesterday I finished Takedown, Tsutomo’s book about tracking down Mitnick. Generally the accounts agree. The framing or emphasis, however, changes. 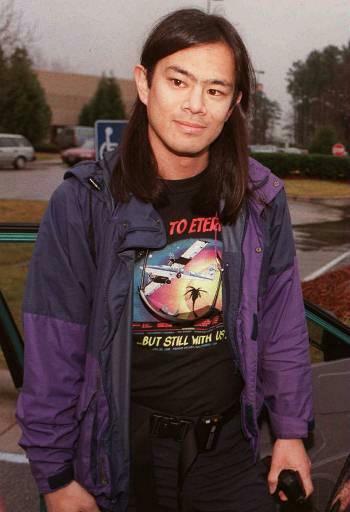 So, for instance, Shimomura (who had the time worked at the San Diego Supercomputer Center, emphasis his own personal skills and generally dismisses Mitnick as copying others or using trial-and-error techniques. Mitnick’s book actually agrees with this, where he is dismissive of the press’s wilder claims, and instead emphasizes the greatest tool he had was social engineering — that is, being a con-man. This pattern — both books largely agreeing on facts, but differeing in the interpretation of facts — even extends to Hollywood. 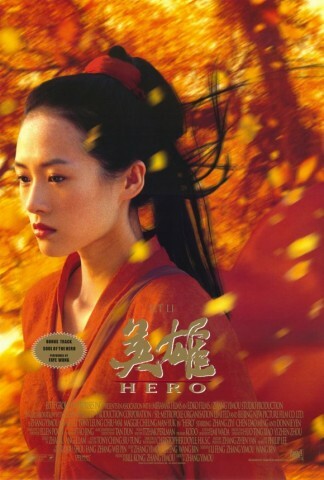 Both Shimomura and Mitnick have mentioned Mitnick’s fascination with the 1992 Phil Alden Robinson film, Sneakers, starring Robert Redford, Dan Akroyd, Ben Kingsley, River Phoenix, and Sidney Poitier. Shimomura chalks this up to Mitnick’s fixation on Robert Redford. Mitnick, in a talk to my employer, described Sneakers as the most realistic movie about hacking every filmed. After re-watching it, I agree. The protagonists of Sneakers are not especially amazing when it comes to technology. They are great at social engineering — being con men. The whole topic of “social engineering” lets me talk about one of the most disorienting things about reading these two books. Kevin Mitnick was a social engineer — a con man — but one who did not seek to profit from his work. So he writes in a friendly (if manipulative) way that makes you sympathize with him. Shimomura, by contrast, is a jerk. The book is filled with criticisms of anyone who has helped him or any place that was good to him. Reading Takedown is an emotionally exhausting experience, while reading Ghost in the Wires approaches the experience of having a massage — you’re no longer observing the world quite as objectively, but that’s not the point. “I have no idea why Andrew [Shimomura’s mentee] told you to start cleaning up,” I said, incredulous. Seiden, who is a computer security pro, was angry at having been misled at such an error. “Last time I take orders from Andrew,” he muttered. His task was no, we agreed would be to resume monitoring Mitnick’s activities on Internex for indication of how deep his supsicions now ran. Seiden was still fuming with indignation as we ended our call. A good leader makes others great. Even cantankerous perfectionists like Steve Jobs can get excited in people. Shimomura instead criticizes and denigrates those close to him, to make himself appear brighter. In keeping with this trend, Mitnick even gives Andrew’s family name twice, while in Tsutomu it is only given once, in Tsutomu’s co-author‘s acknowledgements. I’m glad I read both books, but Ghost in the Wires is both more up to date and less grating. To the best of my knowledge, I have never called any American “unAmerican.” I have generally thought people who complain of this are making up strawmen. The White House asked YouTube on Tuesday to review an anti-Muslim film posted to the site that has been blamed for igniting the violent protests this week in the Middle East. However, the video remained on the site as of Friday afternoon, and it is posted many other places on the Internet. This activity is unAmerican. It is a direct assault on the First Amendment, because the White House finds it easier to censor American speech than defend it from terrorists. Those individuals who authorized or participated in this are unAmerican. It is important that they be removed from office. I am not talking here of President Obama, Secretary of State Clinton, or others. It seems deeply improbable that either of them would be stupid or evil enough to authorize this. Evil tends to be to banal to directly be the result of great men (or women). That individual or those individuals should be removed from office. The Constitutional form of government would face less harm if the unknown person or person who engaged in this act are removed from office by means of violence (assassination, bombing, intimidation, or otherwise), than if they were allowed to stay. Google, of course, is a private company. What they do with the video should be their concern. But for an Administration flunky to try to remove speech because it is politically troublesome is un American. That flunky must be removed. 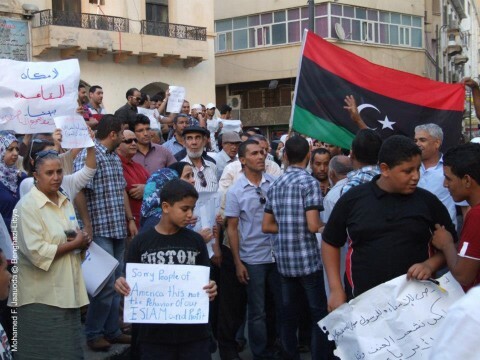 Here are some photos of an anti-terrorism protest by the people of Benghazi, Libya, is response to the murder of American Ambassador Chris Stevens. 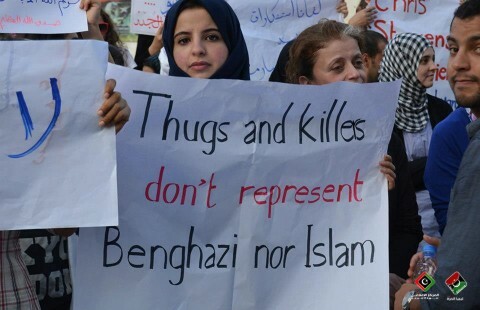 Whether these protests are “spontaneous” or the work of the rulers of Benghazi (or both), they reflect a political consensus to support American interests and oppose terrorism. 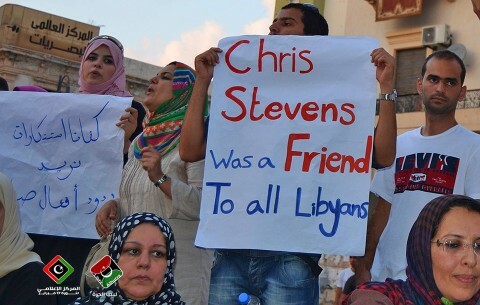 Those who seek to punish Libyans for the work of terrorists should seriously consider the friends that we have their.